There is a new version of this tutorial available for Debian 8 (Jessie). 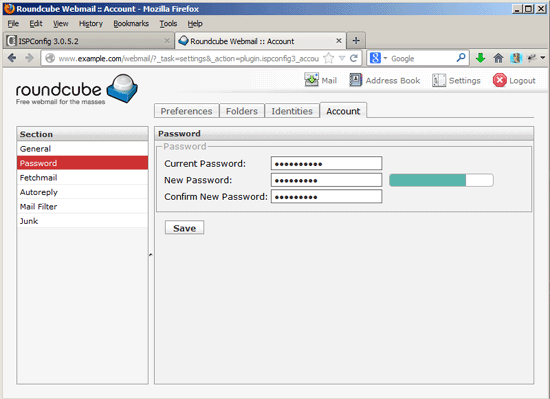 This guide explains how to install the RoundCube webmail application on a Debian Wheezy server running ISPConfig and Apache2, and how to enable the ISPConfig 3 plugins for RoundCube so that users can perform actions like changing their email passwords from within RoundCube. 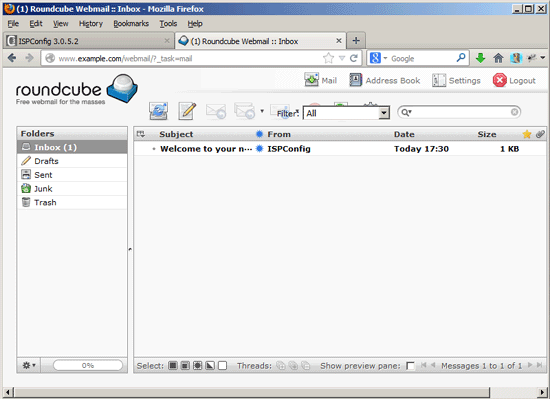 Roundcube webmail is a browser-based multilingual IMAP client with an application-like user interface; it comes with functions like MIME support, address book, folder manipulation, message searching and spell checking. This tutorial assumes you are using Apache2 as the web server on your ISPConfig 3 server; this tutorial will not work for nginx. 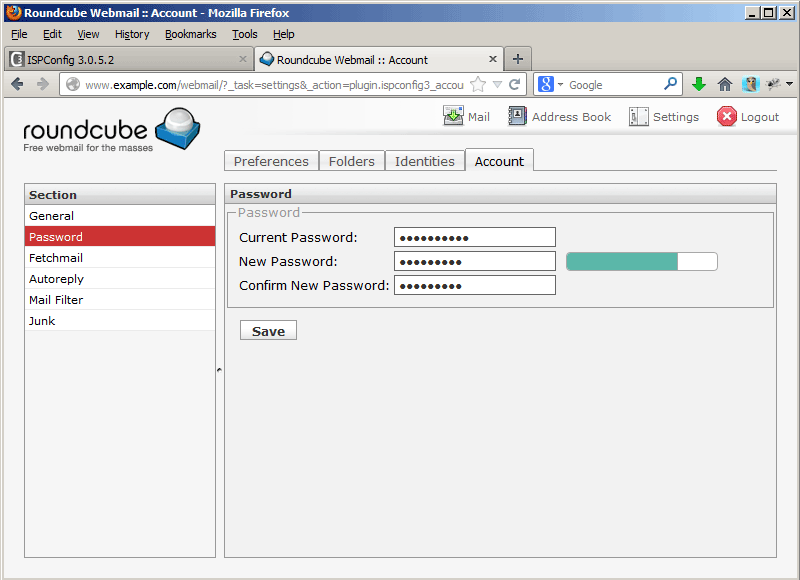 I'm going to install RoundCube from the Debian Wheezy repositories - it is a reasonably recent version (0.7.2.9 vs 0.9.1 (current stable version)). RoundCube will be configured in such a way that it can be accessed from each vhost over the alias /webmail (e.g. http://www.example.com/webmail). 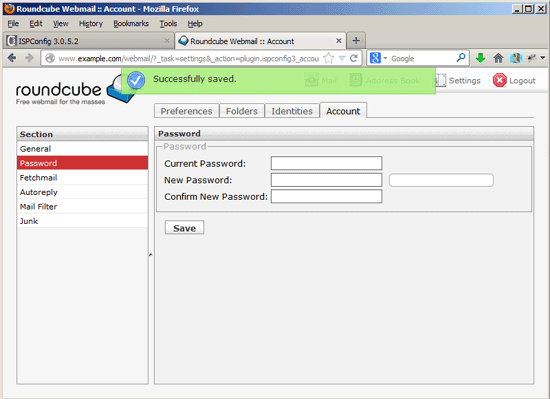 If you are already using another webmail application like SquirrelMail, make sure you disable it completely or at least the alias /webmail. If you have installed SquirrelMail as a Debian package, you can find the alias in /etc/apache2/conf.d/squirrelmail.conf; either comment out the alias to just disable the /webmail alias or comment out the whole file to disable SquirrelMail completely. Don't forget to restart Apache afterwards. This will create a MySQL database called roundcube with the MySQL user roundcube and the password roundcubesqlpassword. # content before setting AllowOverride to None. Otherwise RoundCube will ask for a hostname before each login which might overstrain your users - we want to make usage as easy as possible. i can confirm this! everything works fine with larry's theme. are the plugins running with roundcube 1.0.1? Have you HowTo for install Roundcube 0.9 + ISPConfig 3 ? One year ago, I can remember that the theme of Roundcube was not so much good but later many improvements were made in the theme. The problem in using mail server with hosting is that often emails go to spam or junk box if emails are sent to Gmail, Hotmail or Yahoo. plugins are loaded and displayed data. Login and password are correct. I still have this problem! Still no solution...looking wazzup. If I find - I will post answer. who can help me ??? 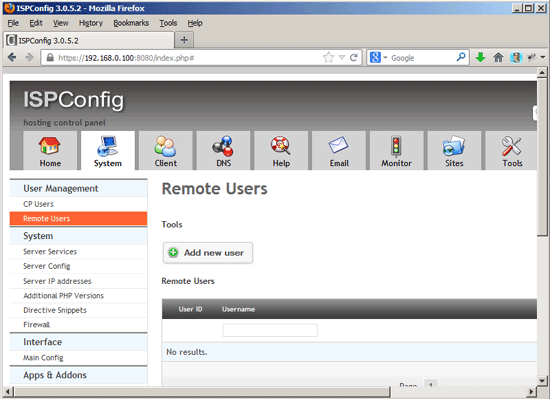 This happens when you have configured ISPConfig to use HTTPS instead of HTTP. Go edit /var/lib/roundcube/plugins/ispconfig3_account/config/config.inc.php and change the soap_url to have 'https' instead of 'http'. I just want to say thank you for the guide on Roundcube. Thank you for this "how to" is working very well for me. Btw. I found no problems keeping the larry theme. 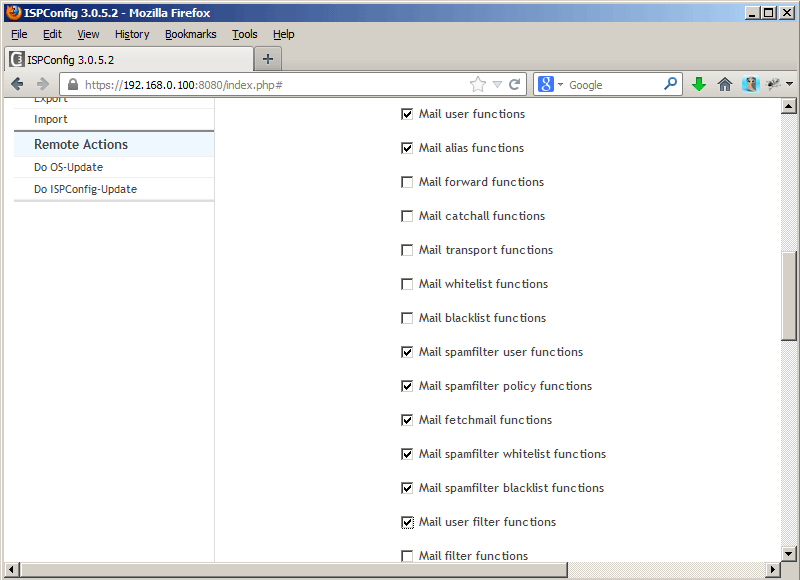 Followed the above, but only to end up with a non working mailserver. The mails can not be received or delivered afterwards. 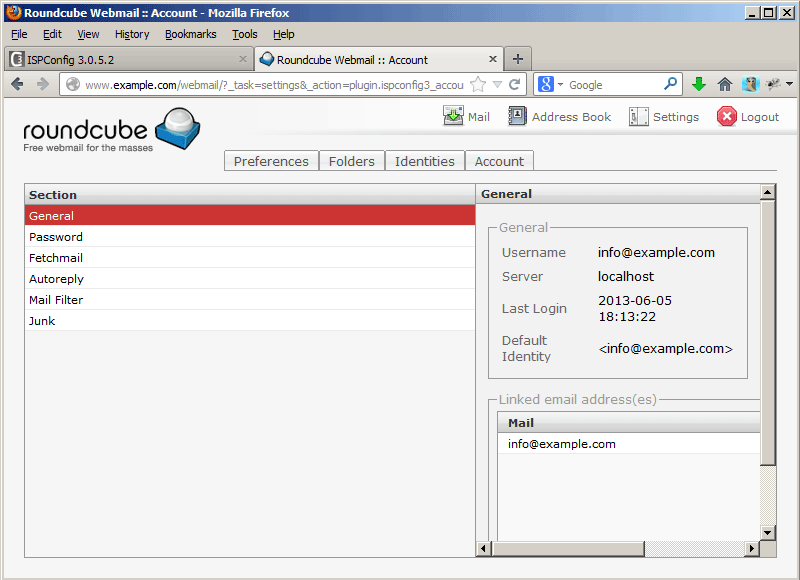 Removing Roundcube will make the mailserver work again. Tried the installation procedure serveral times, ending up with the same problem. Excellent series of guides! Here is a fix which will prevent identities from being changed or additional ones created by the email user. Note: It appears as though google pagespeed might break the plugins with the additions it makes to url requests... anyone confirm ? I just wanted to point out that with PHP-FPM selected under Sites in ISPConfig, I was getting a blank screen even after following the guide meticulously. After switching to FastCGI and restarting Apache, it worked! Thanks for the guide. I can access with serverIP/webmail but cannot access from mydomain.com/webmail because all my sites are with mod-PHP and they dont work with fastcgi. It is a very good idea to write the modified instructions in red and in underline. In this maner, it is impossible to see différence between "spacing caracter" and "underscore caracter" ! very good idea !!! It is working fine right now. tunmails.com:80 197.15.84.92 - - [29/Nov/2014:16:27:40 +0100] "GET /roundcube/?_task=settings&_action=plugin.ispconfig3_autoreply&_framed=1 HTTP/1.1" 500 484 "http://www.tunmails.com/roundcube/?_task=settings&_action=plugin.ispconfig3_account" "Mozilla/5.0 (Windows NT 6.1; WOW64; rv:33.0) Gecko/20100101 Firefox/33.0"
I installed roundcube using this tutoria. It was great, all worked and works fine. Now I would like upgrade roundcube from 0.9x to 1.x ? Any idea how to do it? I would also love to learn how to upgrade to version 1.04 as 0,7 looks very outdated. Thanks for your amazing work btw! Jun 20 06:12:59 mammy100 apache2: Starting web server: apache2 failed! Jun 20 06:12:59 mammy100 apache2: The apache2 configtest failed. ... (...). Jun 20 06:12:59 mammy100 apache2: Action 'configtest' failed. Jun 20 06:12:59 mammy100 apache2: The Apache error log may have more i...n.
Jun 20 06:13:00 mammy100 systemd: Failed to start LSB: Apache2 web server. Jun 20 06:13:00 mammy100 systemd: Unit apache2.service entered failed state. 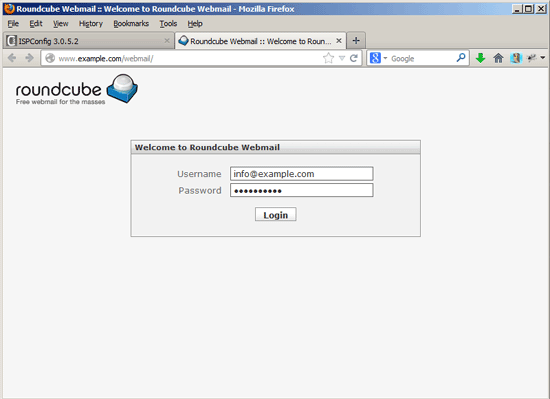 I will be starting it all over again (without roundcube), however I would like to ask is it possible to make the Perfect server tutorials using roundcube, horde or any other webmail as squirellmail does not have HTML based text redactor (I rememmber it had a module for this, but it is such a pain to make it work). So Horde or roundube soon ? I did exactly the same things and endded up having SOAP error : badrequest for the password change.. am i missing anything else to do. works like a charm . This is great but I really need to upgrade to version 1.1..... PLEASE HELP ME! I upped these to 25M and 30M and all was well. 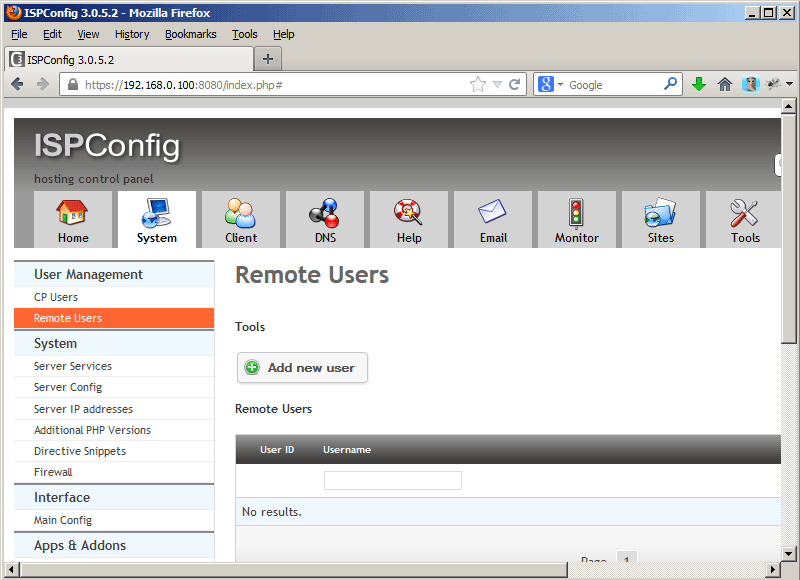 Just installed latest ispconfig. Seems to work more or less. I have a strange behavior on emails. The emails are received but I don't see them in the webmail. Tried squirrelmail and roundcube, same thing. Hi all, all works fine except the settings, if i click on settimg button it give me a 500 error please someone can help me to understand ? 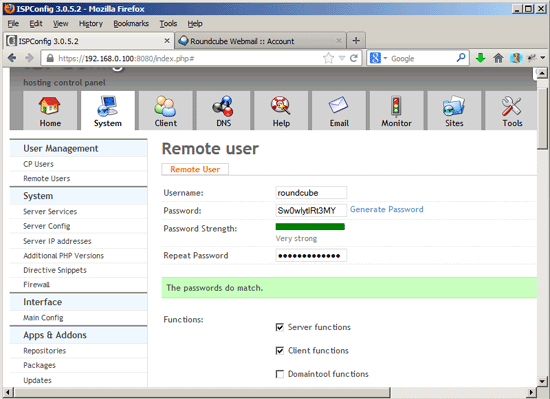 Hi do there is tutorial how to do add password plugin and other to IspConfig 3.1 Debian 9 ? We have Roundcube 1.2.3 there. Ussing this tutorial not working. It is highly recommended to not use that method as you bypass ISPConfig, your method will fail in larger setups and password corruption will occur or the password change will not take effect at all. Instead of using this plugin, just install the ISPConfig Roundcube plugin which contains a password changer that does the password change the correct way by using the ISPConfig remote API. The ISPConfig RoundCube plugin does not depend on a specific OS version, so you can use it with Debian 9 as well.